Pro Evolution Soccer 2018 will stage an online multiplayer beta for PlayStation 4 and Xbox One beginning this week and running until the end of the month, Konami has announced. The beta will kick off at 4 a.m. ET on Thursday, July 20 and go to midnight, July 30. The beta will offer quickmatch and 3-vs.-3 online co-operative play. Players will be offered their choice of the Brazilian or French national teams, playing at the Neu Sonne Arena. Other options include day or night play in good or rainy weather. PlayStation 4 users will not need PlayStation Plus to participate. On Xbox One, an Xbox Live Gold subscription is required. 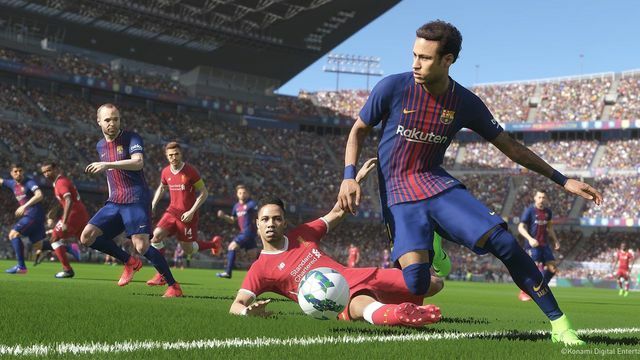 Adam Bhatti, the global product manager for Pro Evolution Soccer, said there will be a demo closer to PES 2018's launch. The beta is "not to sell the game," and is meant to test the online code. Pro Evolution Soccer 2018 launches Sept. 12, 2017 on PlayStation 3, PlayStation 4, Windows PC, Xbox 360 and Xbox One.